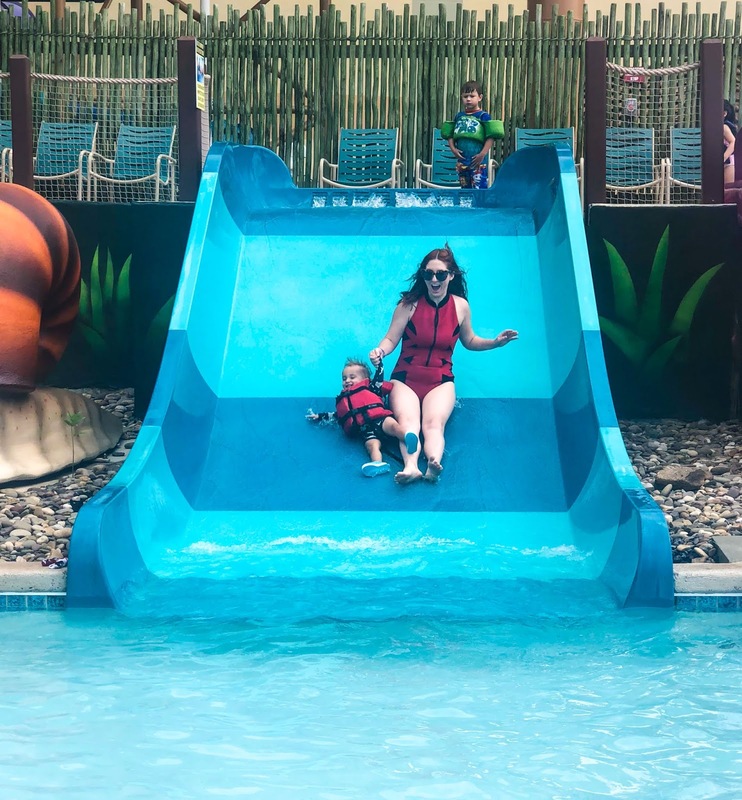 We learned a lot over the two-day stay at the resort and found our experience to be pretty great and would absolutely recommend you check out one of their resorts if you're in the market for an adventure with the kids. 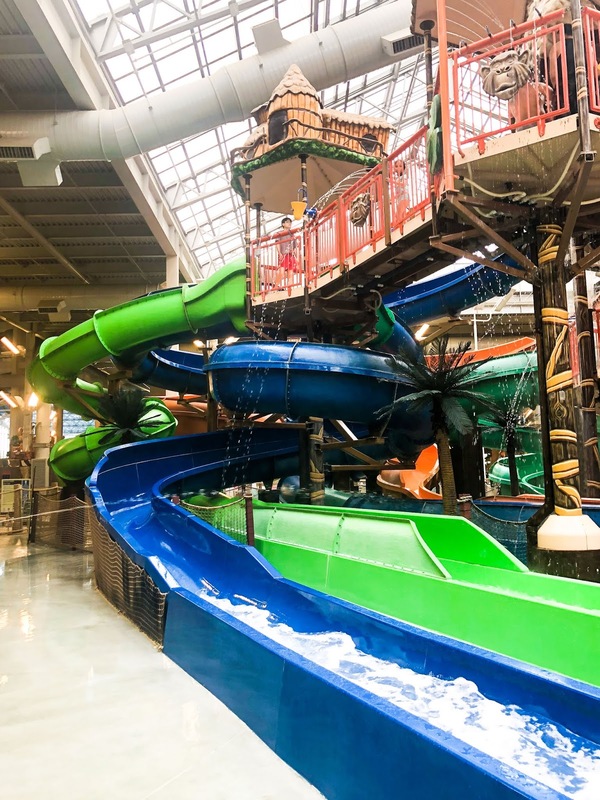 If you're new to Kalahari, it's America's Largest Indoor Waterpark, Resort and Convention Center. 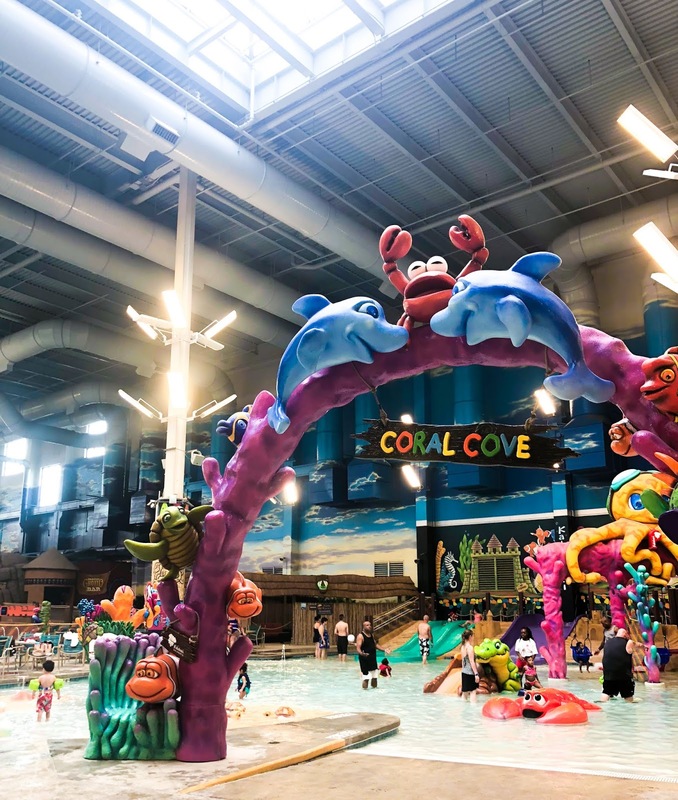 It not only has an Indoor/Outdoor waterpark, but also has a ton of alternate experiences from arcades, bowling, mini golf to movie theaters and spa treatments. It has options for all walks of life and lifestyles under one roof. We spent the majority of our time at the waterparks, coming up for air only for meals and sleep. It was a great experience for both the big and little kids in our family. They have an incredible variety of slides; from small ones for the little ones, to extreme attractions for our 9 year old. We even got our 7 year old to muster up the courage and ride along on a few - he loved it! I was so relieved to see that there was just as much stuff for the baby to do as the older kids. It's possible he had the most fun during our stay. When you check-in you have the option to link your wristband to your credit card during your stay. I highly recommend you do this. 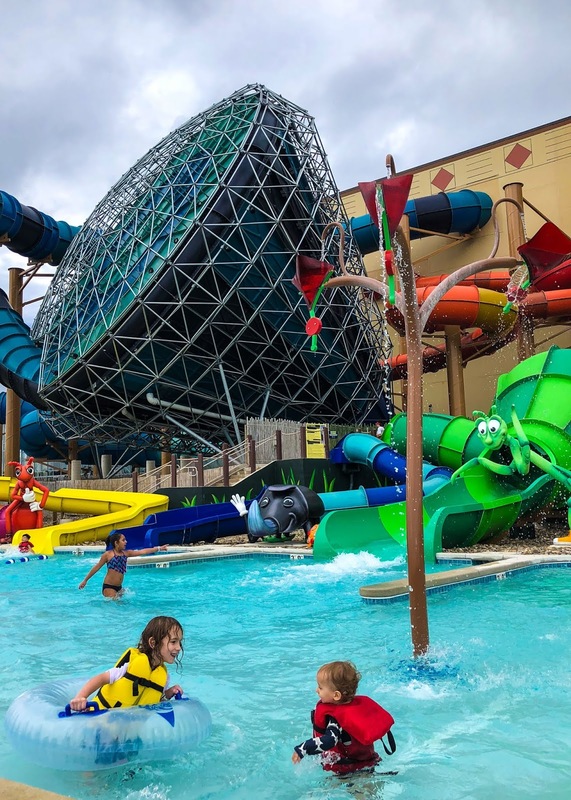 Not only do you get to ditch your wallet during your visit to the water park, it also makes things a lot easier. We used it for everything from locker rentals to coffee in the morning and all of our meals. It made things a breeze during our stay with just a swipe of the wrist. Note: the card activated bands will be blue while the other guests, ie: the kids will be white. 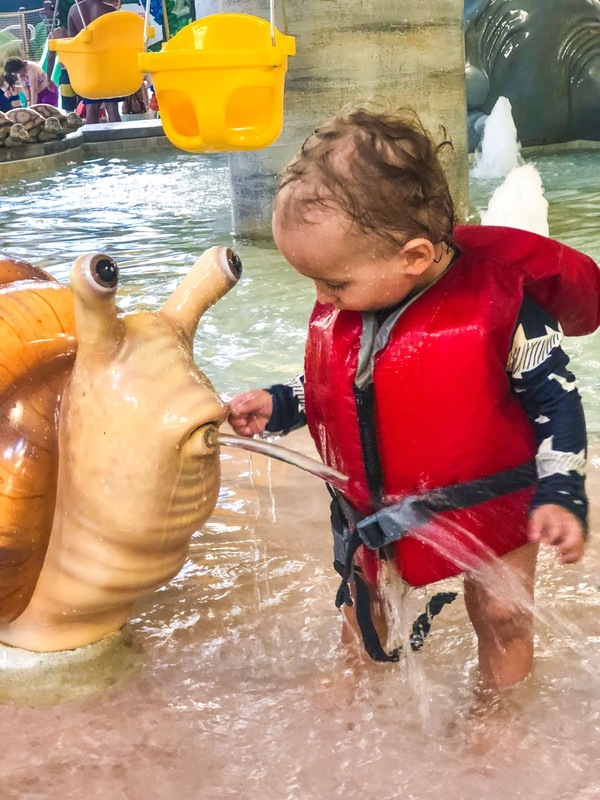 If there's one thing Kalahari and I are on the same page with it's water safety. They do not play when it comes to kids and water safety. 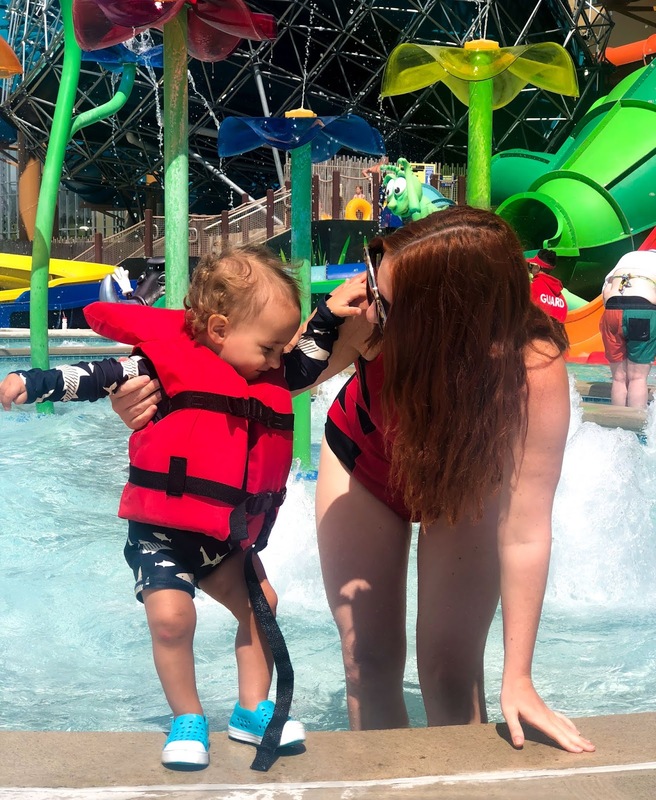 First off, all children under 48" are required to wear a life vest throughout their time at the park. There are several lifeguards stationed at each attraction and they take their job very seriously. They're helpful, informed and watch kids like a hawk. We spent about two hours in the lazy river with Indy napping on our laps and each life guard we passed was always checking for people under tubes or underwater. It was extremely reassuring to a neurotic mom who worries nonstop about kids and water. 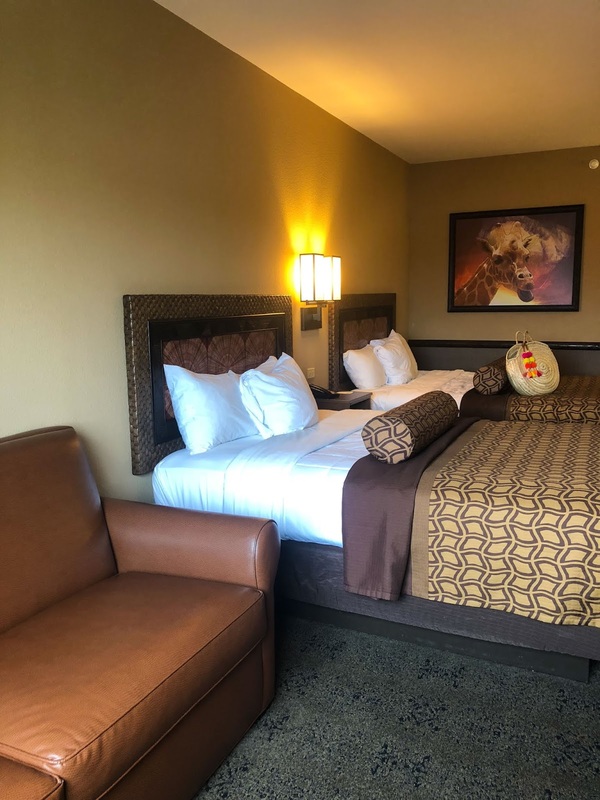 I was pleasantly surprised with the accommodations at Kalahari, a Desert room on a Friday night ran about $299 and included 4 Guests (and the baby - children under 3 are FREE) to the water park for the day of our stay and the check out day. Think about it: two days at an amusement park for 4 will set you back about that much without a hotel room stay. It's huge bang for your buck. The rooms are clean and large; and the staff is extremely friendly, especially considering the volume of people that go through on a daily basis. Everyone was polite, helpful and considerate. Kalahari has several dining options throughout the resort and the park. There are a couple of options inside the park itself, but found that we preferred to go out into the resort/hotel area for a sit-down restaurant setting with more options. The prices are reasonable and you can go right back down to the waterpark after you eat. Don't get me wrong, I love a good chicken tender basket with fries! And we totally had it for lunch the first day, but after a few sittings of fried goodness one kind of starts to need a salad to munch on. Plus, some of the dining options have a kids eat free special at certain times so it pays to skip the "fast food" in favor of other options. We loved the Ivory Coast Restaurant & frequented the Java Manjaro for our caffeine and breakfast-on-the go fix. They also have room service which we used to order a surprisingly delicious pizza on our first night at around 11pm. Win! While I loved our experience I found that certain times and dates are more crowded than others. We checked in on a Friday morning and found the day to be a breeze when it came to getting on slides and around the park. There was rarely a 10 minute wait and plenty of places to sit during the day. I noticed during certain times the park emptied out for lunch and dinner, at around 2pm and 6pm. After 7:45pm was like having the park to ourselves, the kids LOVED IT. The older two insisted on staying up until the park closed at 10pm. We made it to about 9:15pm before they realized how exhausted they were. The next day, Saturday, was a whole different experience. But I have to say for a weekend it wasn't nearly as crowded as I expected it to be. The wait for slides was a little longer, but not more than 25 minutes or so. It was extremely manageable and comfortable. I would recommend, if you can, going on a weekday. It's a way different experience, especially if you're bringing your family along. 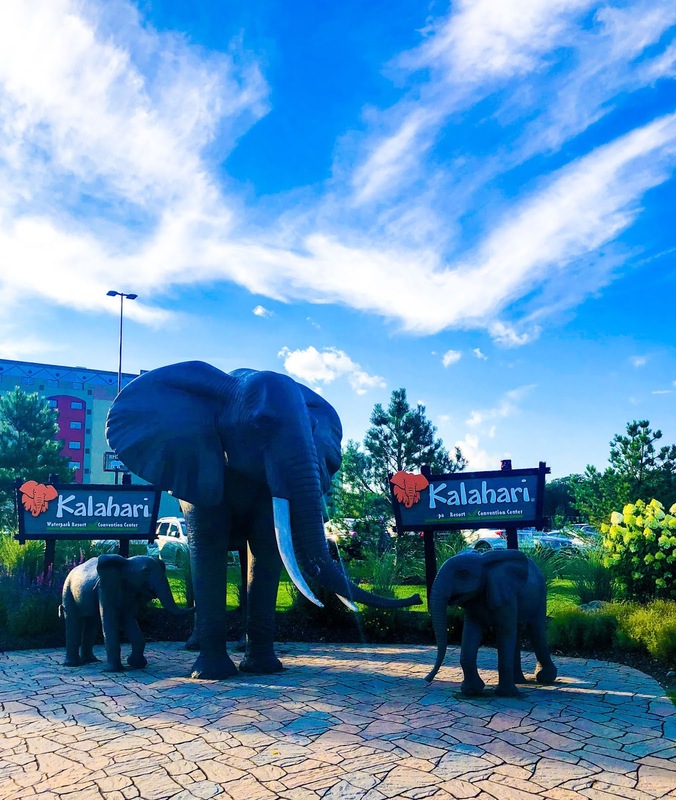 Official hotel check-in at Kalahari is 4pm. However, you can come as early as 9:30 to pre-register and enjoy the park. They alert you via text when your room is ready, which turned out to be around 3pm. Before that, we just kept our bags in the car and David brought them up to the room when we got the text; then came right back to the park. It took about 20 minutes total. You use your wristband to enter your room and it's a breeze. As for the waterpark, I definitely went with the option to rent a locker each day. It's $10 for a small (and $25 for a jumbo) locker that fit the diaper bag, all of our shoes, phones, coverups and extra water bottles. It was in close proximity to the rides so if we needed a water break, diaper change or whatever, it was easily accessible. $20 well-spent to be free of any loose articles. 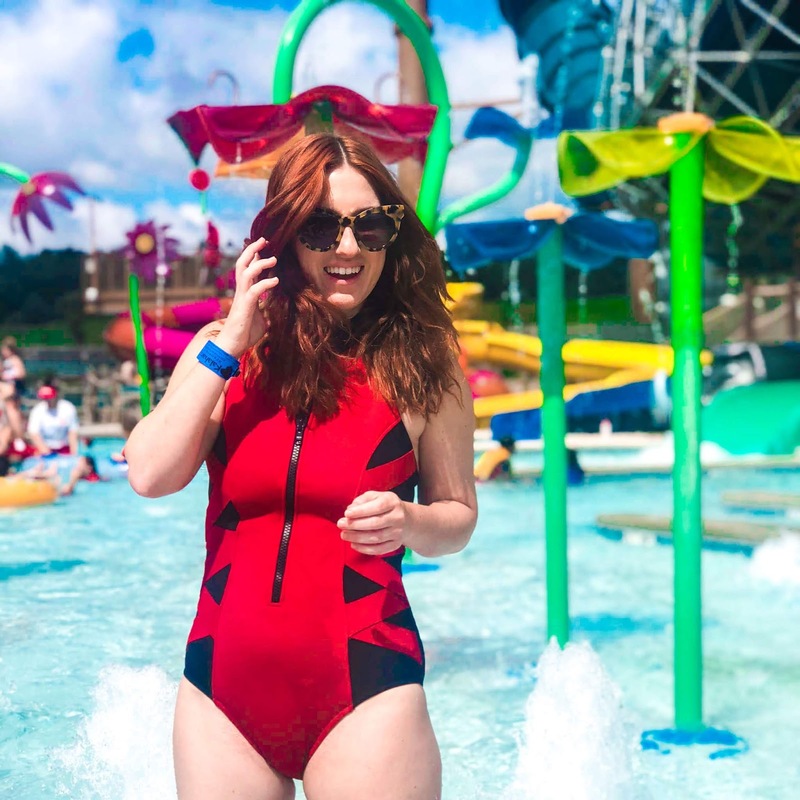 As far as packing goes, I highly recommend you bring a suit for each day at the waterpark and a couple of extra outfits for meals if you would rather not show up in your bathing suit- which you totally can. It's a casual enough environment where you don't have to go over the top with outfit packing. Even if you're a blogger and insist on several outfit changes a day (wink). Been to Kalahari? Share your tips in the comment section below! 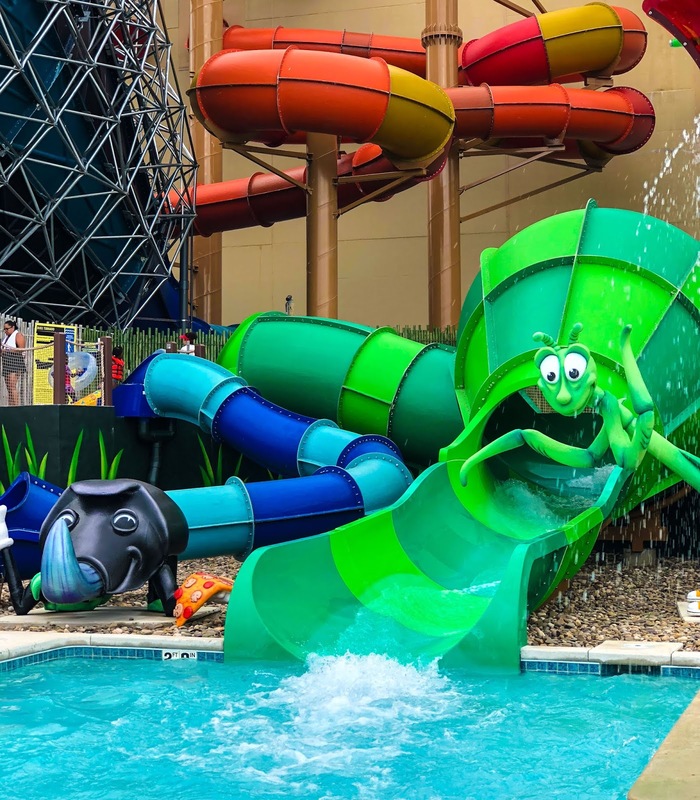 This post is sponsored by Kalahari Resorts. As always, all opinions are my own.